This superb polo shirt in birch grey, is spun from the finest silk, and has the addition of pure cashmere, resulting in a truly luxurious light weight item. The breathable fabric is ideal for those warm summer days, and has an amazing handle and feel. Tailored into the perfect fit, with elegant pearl buttons, this is a beautiful addition to the MrQ summer collection. Also available in dark ebony, navy, sand or summer blue. This superb silk blend luxury mens polo shirt in dark ebony, is spun from the finest silk, and has the addition of 15% soft cashmere, resulting in a truly luxurious item. The breathable fabric is ideal for those warm summer days, and has an amazing handle and feel. Tailored into the perfect fit, with elegant pearl buttons, this is a beautiful addition to the MrQ summer collection. Also available in navy, silver grey, sand or summer blue. 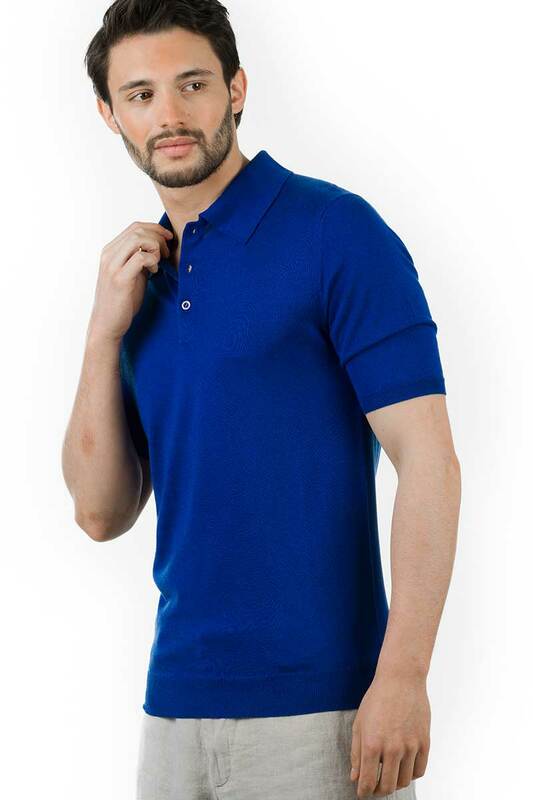 This superb silk blend luxury mens polo shirt in sand, is spun from the finest silk, and has the addition of 15% soft cashmere, resulting in a truly luxurious item. The breathable fabric is ideal for those warm summer days, and has an amazing handle and feel. Tailored into the perfect fit, with elegant pearl buttons, this is a beautiful addition to the MrQ summer collection. Also available in navy black, sand, silver grey, or summer blue. These super luxurious sweat pants have been cut to give optimum comfort, and a great relaxed silhouette. Made from extra fine merino wool and cashmere, they are unbelievably soft. With an elasticated waistband and drawstring, so you can adjust these to the perfect fit. In a shade of melange grey, super versatile, and easy to wear. Perfect for weekend attire, a long haul flight, or just to relax in. Pair with our Dean T, and either the Maverick Hoodie, or stylish Cooper Zip Up.